Hello lovelies! 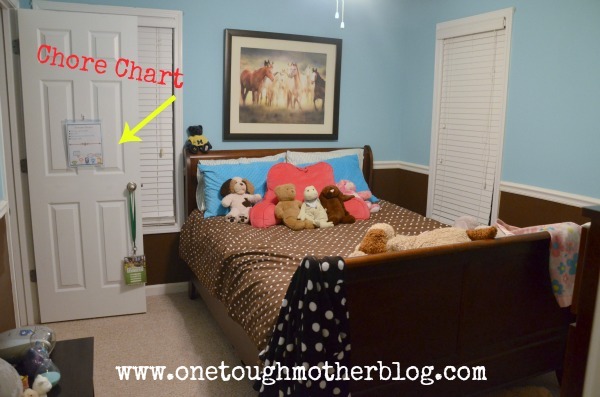 I’m Kirsten from One Tough Mother, and one of the new contributors to My Favorite Finds. I am so excited to be a part of this little family! 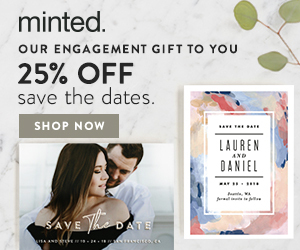 Each month I’ll be sharing different ways to organize and simplify your life. Be sure to stop by One Tough Mother for other organizational ideas, as well as crafts and home decor projects! 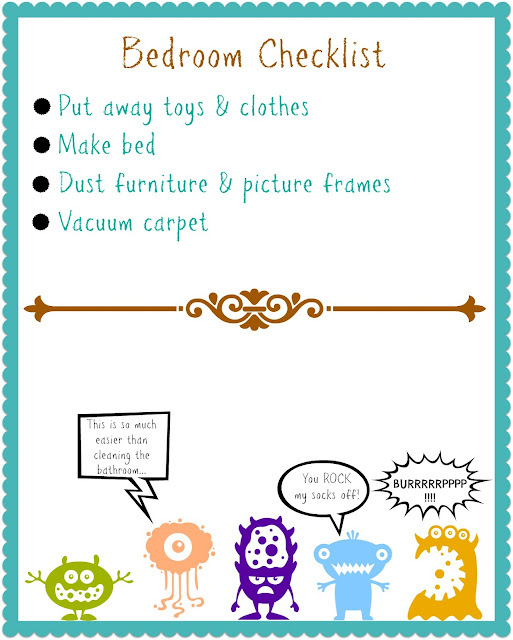 Today, I want to take you to the deep dark recesses of chaos….also known as your child’s bedroom. Now don’t run off screaming just yet, and don’t just close their door and walk away! I’m here to help! I have an almost-11-year-old daughter who did not inherit my gift of organization, so I’m learning to be creative and patient with her. 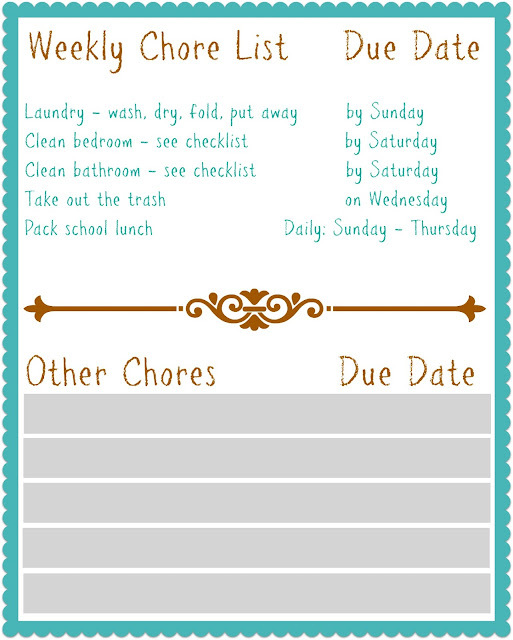 I am a huge fan of age-appropriate chores, and feel that my daughter’s chores are her “job” at our home. We have tried multiple techniques – a chore list posted in the kitchen, a reward system, allowing her to pick and choose which chores she did on which days…. After almost getting to my breaking point a few weeks ago, I decided to have a little chat with my daughter. We came to the conclusion that visual aids, deadlines, and the threat of losing something valuable to her are all motivators to getting her chores done. No more nagging. No more reminders. Either her chores are done by the specified date or she loses something to Mom’s Ransom Box – her new laptop, the Xbox, her sketch pad, etc. And, it’s visible to her every single day. I even broke down her bedroom and bathroom chores so my expectations are crystal clear. Don’t you love those silly creatures at the bottom putting their two cents in? We’ll see how this works long-term. So far, so good. I hung each one of these in a clear sheet protector and used a Command hook to attach them to her bedroom and bathroom doors. (Try these sheet protectors – they have a hole in the top center, rather than 3 down the sides.) We use a dry-erase marker to write on the sheet protector – she checks off her chores as she goes, and I can add more on her chore list if necessary. The best part is, it’s working! We’ve had fewer arguments about chores, her room and bathroom are staying more organized, and we have a more peaceful household overall. Here’s proof! 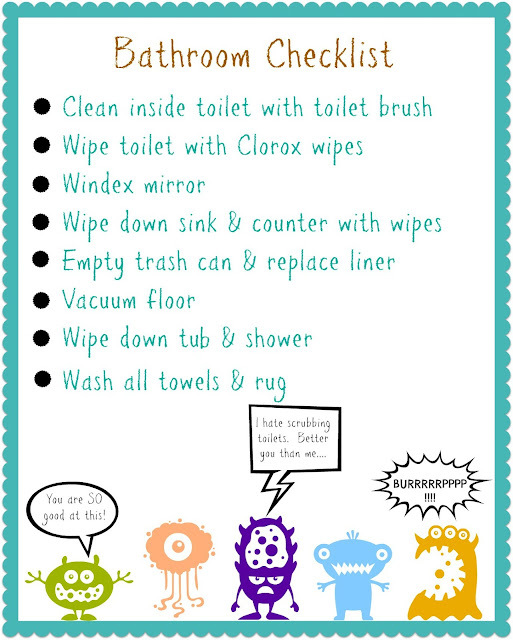 How do you keep your kids organized? I’d love to hear your ideas. And if there’s an organizational problem you would like me to help with, let me know! I’m here to help! I hope you’ll stop by One Tough Mother and say hello! You can also find me on Facebook, Twitter (@onetuffmother), and Pinterest! I love this! 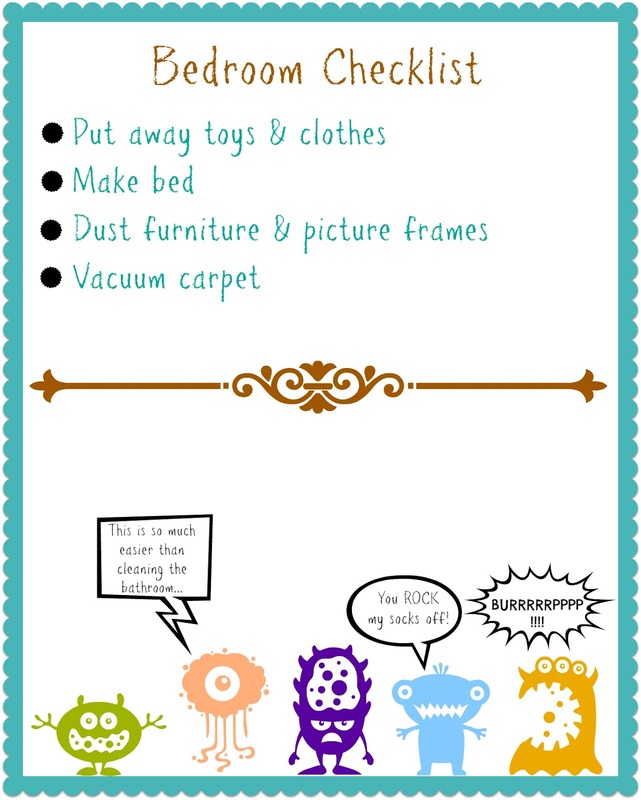 I have a 10-year old and it just dawned on me that he needs to be helping out more around here…great suggestions! Thanks Laura! Glad you stopped by today 🙂 I hope you’ll also stop by One Tough Mother from time to time. Now excuse me…I need that cookie recipe you just posted! Yum! How cute! I really love the little monsters.